With these reviews I will attempt to do as little research as possible. Why bother with research? Why have possible errs and omissions, that are not my own, in my posts…A amiable university professor, who is well versed in the outlaws of solitary, indirectly taught me the importance of taking ownership of all of your own errs and omissions. That is what I will dough…I mean do! Young Miami native: QuESt.In terms of biographical information I confess that I know little about QuESt. 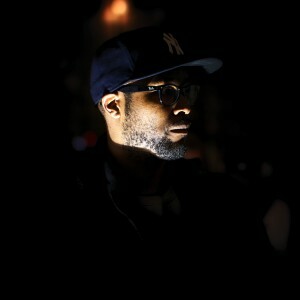 Prior to his most recent album, I was privy to his relationship with, an artist I respect tremendously, Mickey Factz. QuESt’s recent project Searching Sylvan, I assume his name is Sylvan. (Edit: I tried to finding a credible source that his name is Sylvan. Couldn’t I have a pretty good feeling it is) The title itself, to me at least, conveys a lot of what the record entails, Inner Reflection. My hypothesis is QuEST’s name is Sylvan and he is trying to find self. Expounding on that notion, QuESt is lost and maybe if he tells us his journey he can finally find his way. As a whole the project conveys emotions of being bewildered within one’s own solitariness. He is far from his dream and submerged in his own doubt. I find in hip-hop we are within a moment where there is much more self-reflection. Not to say he was the originator, but Kendrick Lamar exemplifies that earnest inner reflection through a hip-hop record can be successful. With QuESt’s record it is undeniable that Lamar’s influence is present and consistent throughout. In hip-hop influence is often confused with copying or not being original. Among the hip-hop enthusiasts mimicking another artist’s style is equivalent to the academic claims of plagiarism from a university. Restriction in any art form leads to devolution. There are versions of replication or an artist trying to reproduce previous successful frameworks. All the hopes for gaining mainstream success. QuESt (I’ve now come to hate typing the name out correctly) does not fall into either of those categories. His narrative is earnest and though he does incorporate a formula that has most recently been commercially a success (Good Kid Mad City), it is obvious that he is not using this framework in hopes of gaining public favour. Additionally if QuESt desired quick popularity there are many other routes, which require less effort as well, he could have taken to be popular. In 2014 music has become no different then many of the other consumed products, on the globe. Consumers need it rapidly quick; quality may not even be an essential need anymore. This idea is not new, I am sure older generations have felt this way for decades. Hip-hop has become a ring tone factory, where the recording process has become a small challenging moment before the possibility of millions. Searching Sylvan is clear, calculated, concentrated contemplation. Hope you find what you are looking for QuESt. No problem, I appreciate you reading my post. Solid review, gonna give this record a listen because of it!